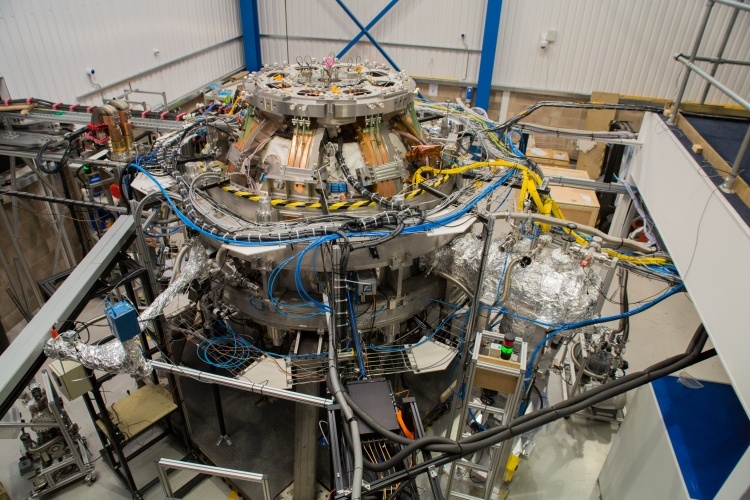 Privately funded UK venture Tokamak Energy has hit plasma temperatures hotter than the sun’s core for the first time, reaching 15 million degrees Celsius. The milestone was achieved using the ST40 device, the latest in a line of tokamaks the company has built in pursuit of commercial fusion. Using a technique known as merging compression, the ST40 releases energy as rings of plasma that crash together and magnetic fields in the plasma reconfigure – a process known as magnetic reconnection. Merging compression involves high electric currents running through the internal coils of the ST40, requiring power supplies to deliver thousands of amps in seconds. According to Tokamak Energy, it combines intricate electrical engineering processes that also place high demands on the mechanical engineering of the whole system. Though 15 million degrees may be an important landmark on the journey, it is a long way from the 100 million degrees required for thermonuclear fusion on Earth. The ST40 is the third machine in a five-stage plan that Tokamak Energy believes will lead to commercial fusion energy by the end of the next decade. Though it won’t be capable of energy gain – the holy grail of fusion – the ST40 is designed to reach the magic 100 million degree mark. Tokamak Energy will now be working towards that goal in a new facility with upgraded equipment. “The world needs abundant, controllable, clean energy,” said Dr David Kingham, co-founder of Tokamak Energy. “Our business plan is built on strong scientific foundations and this major milestone provides further validation of our compact spherical tokamak route to fusion power. Are we talking degrees F (or R) or degrees C (or K) ? Surely someone at The Engineer should have asked the question before publication. It’s Celsius Alex. Amended now. UK (and most of the world) uses Celsius , not Fahrenheit anymore. But it should be in K really! At these temperatures it really just academic! The Celsius at beginning of report wasn’t included it until after I queried it. See the ‘Reply’ added to my post. C or K doesn’t really matter. 0 C is 273 K so 15 million C is 15 million K, because at that scale the difference of 300 degrees doesn’t matter. Also, fun fact, while both Fahrenheit and Celsius need “degrees” (degrees Celsius, degrees Fahrenheit), Kelvin doesn’t need “degrees” because it’s absolute. You can say 100 Kelvin, 400 Kelvin, 1 million Kelvin. At such temperature levels, C or K, makes little difference, and I am sure they are referring to K.
I fail to see why 100 million degrees is important, if in the sun no such temperature exists. Is it because of the extreme gravity in the sun, compared to the paltry 1 G here on Earth surface? Essentially PV = nRT Some of these Fusion Devices are also trying to increase the pressure to lower the Temp requirements also. Due to the high gravitational force in the sun’s core fusion can occur at lower temperatures than in a man made fusion device. Therefore, we need to increase the plasma temperature to increase the kinetic energy of the plasma particles thus creating similar conditions to enable fusion to occur. The particles need to be forced together, close enough to overcome their mutual electromagnetic repulsion and let the weak nuclear force take control. To do this often enough to get any appreciable energy you can either a) pack the particles close together ie density like in the sun to make collision more common, or b) use a much more diffuse plasma but at much higher temperature ie higher speed to make collisions more energetic. Exactly the massive surface gravity of the Sun causes extreme pressures at its core increasing particle density, not the gravity itself. 15 Million C Degrees for how long time ? Anyone know their magnetic field density, are they using superconductors? In the video it looks like copper rings. So looks they have not got there superconducting upgrade yet. And how far are they extrapolating in nT Tau E for relevance, current Q values? fun fact (according to Professor Brian Cox): kilogram-for-kilogram the human body produces 6,000 times more heat than the sun – perhaps that is why they need 6 x higher temperature, to speed things up? to deliver thousands of amps in seconds. If I recall, there was an installation somewhere on the outskirts of a major European city (Paris?) which similarly to that described above, could divert the entire output of a major part of the grid, literally for a nano-second, to simulate the supersonic air-flows of sustained flight characteristics. I believe the greatest fear of the authorities was that a terrorist group, knowing of this, might be able to use such for disruptive purposes. ie stop the switch-back to normal operations. This was why its actual location was a closely guarded secret? Hi Mike, Not sure if you are referring to the experiments conducted by Nicola Tesla at Colorado Springs ? Perhaps the most important word in the title is ‘privately funded’ -congratulations to whoever has been able to explain what they are proposing to some ‘money-bags’ and get them to agree to support it! At these temperatures the unit of degrees is academic! When a star is being formed it has no real temperature at all, only mass. So why don’t the scientists try and change the mass to simulate a stars birth. No energy is used at all to produce fusion in a star! They are looking at the problem from the wrong side as far as I can see. Yes, but you would need to wait for a million years to get the critical mass needed to create a nuclear fusion reaction in that case ! The MIT Tokomak hit 35 m deg K about 2 years ago at over 2 bar and measured fusion occurences, (as per the link on this page). Why are we lagging so far behind MIT?? In addition to Trevor’s comment: Whilst the technology may be similar it is non-identical so we want to avoid any apples and oranges comparisons. I think the plan is to achieve 150 million degrees C at ITER. But there are a lot of hurdles still to overcome like Plasma instability and distortion etc. The idea is you can generate 10 times more electricity than what you input. We will have to wait till 2025 to find out. The CNO cycle – negligible in the sun but significant in more massive, hotter stars acts as a sort of catalyst, with the rate of fusion proportional to temperature to-the-power SEVENTEEN ?!? Yes, but even after hitting the 150 million degree mark, we are still another ten years from harnessing fusion for output to the grid. This has been the world’s greatest physics joke since the 1970’s. It really is starting to look like the King’s New Clothes story to me. At least they should provide themselves a fig leaf. What device is used to measure the 15 million C?